Set sail and take aim at a big jackpot in Battleship Direct Hit!, a 6 reel, cascading reels video slot from WMS. Based on the Hasbro board game, the number of ways to win changes with each spin and can reach a massive 117,649. Also on offer are symbol upgrades, a free spins round with added wilds and a shot at landing 1 of 4 potential jackpot prizes. Play on your desktop, tablet or mobile devices from between 10p and £100 per spin. The bridge of a battleship is the setting here. You’ll see gun turrets and plenty of instruments as well as ships sailing in the background. On the reels are A to 10 values as well as bronze, silver, gold and purple medal symbols. The logo is the most rewarding symbol. Land 3, 4, 5 or 6 on adjacent reels and you’ll receive a payout of 10, 15, 20 or 40 times your total bet. Cascading Reels feature – Battleship Direct Hit! uses a cascading reels game engine. After a winning combination hits, the successful symbols are removed and new ones drop and replace them. The cascades continue as long as a new winner arrives. The number of symbols on each reel changes with each spin. This alters the number of possible ways to win too. This starts at 729. If the reels reach their maximum it offers a massive 117,649 ways to win. Turret Fire feature – after any spin, you could see the turret guns fire off a volley of shots. This will transform lower value A to 10 symbols into the more lucrative medal symbols. A new payout calculation the follows. Free Spins Bonus feature – this is triggered in a slightly unusual manner. There is a card above all 6 reels. Stretched across them are a series of ships. Land a missile scatter and it will fire and destroy the position above that reel. If all the positions of the ship are destroyed, you’ll win the associated number of free spins. New ships sail into view with each cascade. The number of free spins awarded depends on the type of ship sunk. You could win 5, 10, 15, 25 or 50 free spins. There are 2 ships on view during each cascade. In theory, you could sink a pair of 50 free spin ships and land 100. Things are slightly different once the free spins begin. For starters, wilds are now in play on reels 2, 3, 4 and 5. Sinking a ship could net you an extra 5 free spins. It could also land you 1 of 4 possible jackpot which award prizes of 20, 100, 500 or 2,500 times your total bet! There’s plenty going on in Battleship Direct Hit. The cascading reels keep things moving along and the free spins with the associated jackpots offers some decent potential. 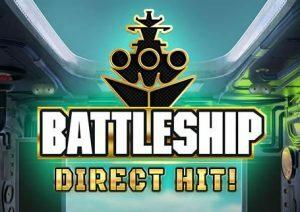 WMS has created a very decent video slot in Battleship Direct Hit. If you enjoy the military theme, then you’ll want to take aim here. I also recommend you try some of WMS’ other superb offerings with Kronos Unleashed 1 not to miss.